Hear more about Heritage Seedlings and Liners on OSU’s weekly podcast PolliNation. Founded in the early 80s, Heritage Seedlings began by growing woody ornamental plants for wholesale trade. Japanese Maple, Birches, and Magnolias were just a few of the 700 different kinds of plants they grew. 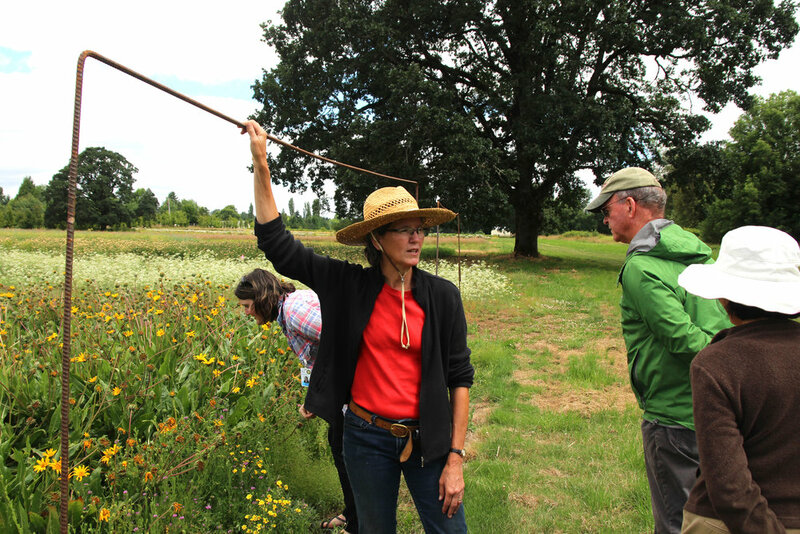 In 2001, they embarked on a new endeavor – growing native plants and wildflower seeds to aid in the restoration of habitats within the Willamette Valley. Jolly Krautmann standing among a stunning variety of wildflowers. 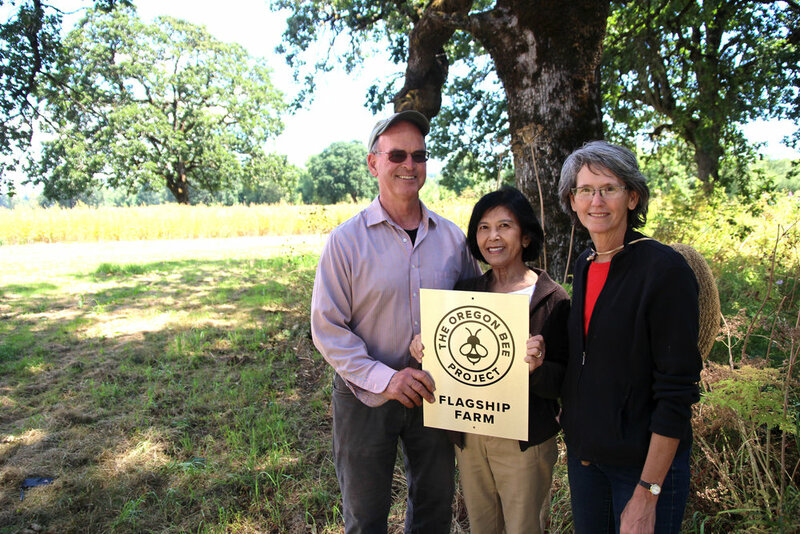 The owners and staff hope to inspire a sense of imaginative stewardship among other private landowners in the Willamette Valley. By protecting edge habitat and being intentional about using it to promote native pollinators and plants, landowners can help to connect the fragmented local habitats and demonstrate to other farms what is possible. Linda Boyer talking with visitors admiring the blooms. Linda Boyer with some native plant seeds. 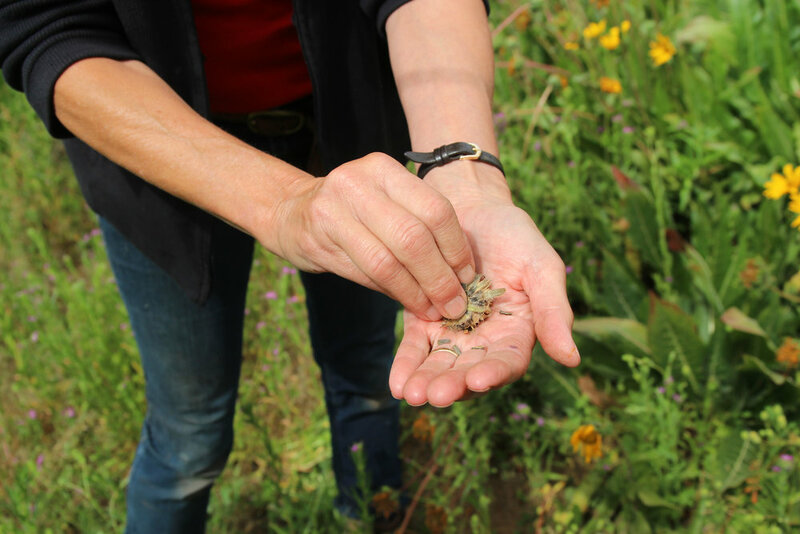 At the onset of the restoration projects, Lynda quickly discovered that there were few suppliers of native seeds to aid in the restoration of their prairie, oak, and wetland habitats. In addition, the diversity of native species was low, especially for upland prairie species. To meet this need, Heritage began the production of native plants and wildflower seeds, for both themselves and others working to restore Willamette Valley habitats. Today, they produce roughly 4,000 lbs. of native seed a year and have over 100 species in production on 40 acres.